Openherd: Curly Eye - Alpaca product and service supplier located in Columbia, Missouri owned by Gary & Mary Licklider. All-natural, hypo-allergenic luxury! Curly Eye's premium comforters are covered with a gorgeous natural ivory 500-thread-count organic cotton sateen and filled with 100% alpaca fiber. Alpaca is three times warmer than wool, so you get incredibly cozy warmth without a lot of bulk. Alpaca is also known to be hypo-allergenic, which means that it presents an excellent alternative for many people who are sensitive to wool or down. The fiber is shorn from the alpacas in the spring at Curly Eye, an alpaca farm in Missouri, then sent to a mill to be washed, carded and made into the comforter batting. 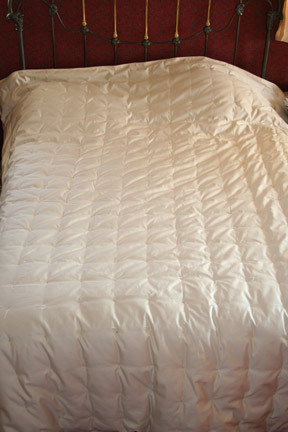 When it comes back to Missouri, we add the luxury cover and knot the comforter by hand. The result is a beautiful and practical luxury.